Farm, Family and Finances: How Much Money Are You Leaving on the Table? An afternoon full of tips, strategies and stories about what works and what doesn’t for farm business families. Denise will teach you how to understand your financial statements, the key financial ratios your lender is calculating, equipment lease per acre cost analysis, cash flow management and how the assets you hold inside and outside of your corporation can help or hinder transition. David will focus on various methods used to have financial success for both the farm and personal side. Focusing on managing RRSP, RESP, TFSA and other strategies to assist with overall management of assets and how that can affect transition. 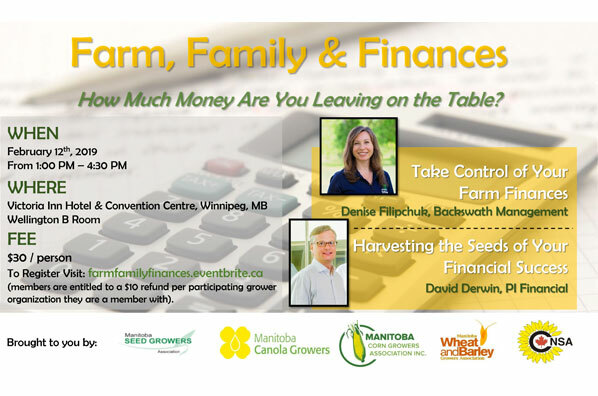 Attendees will have the opportunity to ask our experts financial management questions and gain from their knowledge and experiences working with farm business families.